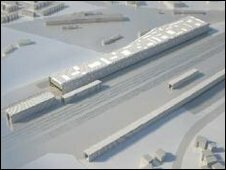 Up to 550 jobs could be created when two new Thameslink train depots are constructed in London and Sussex. Network Rail said it planned to build depots at Three Bridges, Sussex, and Hornsey, north London, to accommodate the longer Thameslink trains. A spokesman for the company said the depots would create 550 permanent jobs and also boost the local economies. The buildings, which are part of a £5.5bn scheme to improve Thameslink, will take about 18-months to construct. Network Rail said the jobs would be a mixture of skilled, unskilled and administration positions. Graham Goodwin, of Network Rail, said: "About 550 jobs will be created between the two sites, that doesn't include construction jobs. "These are permanent jobs after the depots open. They include drivers and carriage cleaners. They will be employed by the train operators and the firms that maintain the rolling stock." The plans to upgrade the route that crosses London from north to south were given the green light in 2007. The money will be spent over the next five years in a bid to reduce delays and increase overall efficiency. An extra 14,500 seats will be available to passengers once the infrastructure and rolling stock has been updated. Network Rail added in a statement: "These new longer trains require modern maintenance facilities and railway sidings that are long enough to accommodate them. "Following a careful site selection process, carried out by ARUP, two new depots are planned. One is to the south of Three Bridges and the other near Hornsey."